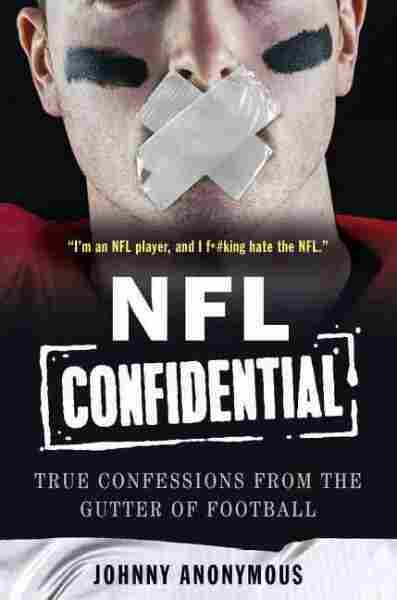 'NFL Confidential': Anonymous Player On Why He Loathes The League From concussions to domestic violence, a current pro football player tells all about what's it really like on the gridiron and beyond in NFL Confidential: True Confessions from the Gutter of Football. It's unusual to hear a current NFL player criticize the league, let alone talk frankly about its handling of concussions or its response to domestic violence scandals. But a new book does just that. It's called NFL Confidential, a memoir of the 2014 football season written by a player who goes only by Johnny Anonymous. "You get to the NFL and you realize that the only reason you're there — and the only reason they want you there — is to make money for the NFL, and they'll compensate you for that," he says. "It's either come clean and tell all as it stands from my mouth and my voice with my picture and my name on it, and football cease to exist in my life," he says. "Or I maintain my anonymous stature, and I can really give the world a piece of what this game really is for the guys that don't mean anything to the game — and continue to make money." The current league minimum salary for a rookie is $435,000 — for experienced players, it's even more. I think it's just a general acceptance of, I don't know, what seems normal, which is kind of sad to say. Obviously, when that came out, we were all sitting in the training room and it comes up, and it's disgusting. We all know it's disgusting. A handful of guys made remarks of, "This guy shouldn't be in the league; this guy is disrespectful to women." And then 10 minutes later you've got a guy making a joke about it. So, there's different levels of respect that players will have, but I think in general they have a pretty short attention span. One of the greatest therapy sessions any NFL player has is actually playing the game. You have guys that have demons. They have things that they've dealt with in their life that make them who they are and make them angry, physical men. And you can't just make that disappear. That's literally what fuels a football player to put on a helmet, look at the guy across from him, and literally hit him as hard as he possibly can. For some guys it's fear, which is why you'll see them kicking and screaming and crying. For some guys it's shock. I know for most of us — probably all of us — the first thing you think is: "I'm done." That's it. You think the injury's gonna take the game away from you. You have to [take painkillers]. It's the only way you make it through. I can tell you right now, honestly, that, if I'm playing a game, I cannot complete that game without painkillers. I will not be an effective player. Recently I had a conversation with a guy that played eight years as an offensive lineman and was told to me as being a very intelligent guy. I was actually excited to talk to him. And within seconds of speaking to him, his eyes hung heavy, his voice was slurred, the effects were apparent, he could barely walk, it's terrifying. And I mean there's all the talk about CTE [chronic traumatic encephalopathy] and what brain damage can do to you, but you can't forget about arthritis and just really the downside of every surgery you've had, it's gonna play out when you're 35. Whereas in normal people, that arthritic nature of your body won't hit until your late 50s. At the same time, once you can pass your test, your little computer test that they put you through, you're ready to go back on the field and there's no negative thought. But ... if you have too many concussions on your list, in your medical records — they'll weigh that against you and not sign you back when your contract's up, just out of risk. I think I've had a fairly successful career, and in the same breath I think she'd look at it and go, "What are you doing? There's so much more for you out there."